Analyzer automatic immunoassay Biomerieux Mini Vidas. Ability to perform 65 different tests. Process 12 tests at once. 20 samples/h. Includes original manual . Computer multiparametric immunoassay, serology, immunochemistry, antigen detection and drugs. Digital control Panel. Software and printer built in to the computer. 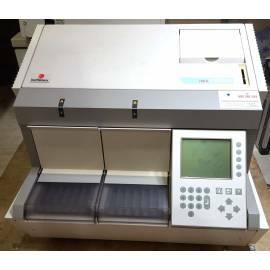 Description: For testing the pipette mechanisms and optical scanner of VIDAS and miniVIDAS™ instruments for accuracy.